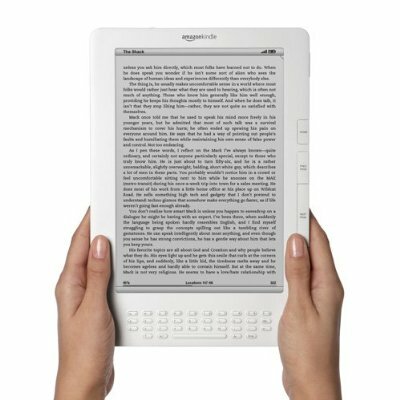 Wednesday online book retailing giant Amazon.com unveiled the newest version of the Kindle e-book reader. The larger 9.7 inch screen is also geared toward a new use for the Kindle, which they also discussed at the product introduction on Wednesday: the display of electronic versions of textbooks, opening up the Kindle to the lucrative high school and college markets. Elisabeth, I’m impressed that Amazon has lined up textbook publishers representing more than 60 percent of the textbook market, according to the company’s press release accompanying the announcement of the Kindle DX. The publishers are Cengage Learning, Pearson, and Wiley. Amazon reported that textbooks under the following brands will be available: Addison-Wesley, Allyn & Bacon, Benjamin Cummings, Longman & Prentice Hall (Pearson); Wadsworth, Brooks/Cole, Course Technology, Delmar, Heinle, Schirmer, South-Western (Cengage); and WileyÂ Higher Education. That’s a pretty strong lineup, and it convinces me that the main strategic purpose of the DX is textbooks, not newspapers. Amazon CEO Jeff Bezos dropped a real bombshell at the press conference when he announced that for books available on the Kindle, sales are already 35 percent of the same books in print, up from 13 percent just a few months ago.Â The chart he showed looked like the proverbial hockey stick, with a dramatic surge in the share of Kindle sales beginning with the launch of the Kindle 2 in February.Â This confirms my sense that Kindle sales were soaring this year, even before the DX debut. As for the DX itself, the big news may be the PDF capability.Â My hunch is that business users will find this new Kindle attractive for reading work-related documents while traveling or at home.Â It could certainly become the reader of choice for lawyers, saving them the work of hauling fat briefcases bulging with depositions.Â I see that the DX will weigh twice as much as the current Kindle, but the larger screen is certainly going to be an advantage for some kinds of reading, especially textbooks and maybe newspapers. Will the DX save newspapers? I doubt it. The potential circulation numbers at this point are too small. But it’s certainly got to be a hopeful development for struggling icons like the New York Times and the Boston Globe, both of which (and the Washington Post) signed up for yet-to-be-detailed promotions in which they will offer discounts on Kindle DX’s if you people sign up for long-term subscriptions. All in all, it was an exciting day.Â I preordered my DX the minute I saw someone Twitter the link to the Amazon page.Â I hope Amazon underpromised and will overdeliver in terms of the shipping date, so that I’ll get my hands on my DX maybe in June instead of August. I’ll have more thoughts about the DX in this week’s episode of The Kindle Chronicles, which I’ll upload on Friday. Thank you for the post, enjoyed reading it.